Sailsoft makes the utilities on this page freely available 'as they are'. Although any comments, error reports etc are of course appreciated, basically Sailsoft will give no formal support on this software. Waypoint Creator is a handy little program for creating route waypoints. You can use a number of different maps, amongst others Bing Maps and Google Maps. To create waypoints, simply click on the map location where you want to set a waypoint. Waypoint Creator will transform the waypoint locations to valid $GPWPL sentences. You can save these both as a text file or as a GPX XML formatted file for input into other GPS oriented applications. The NMEA $GPWPL waypoint files can of course also be used in NemaStudio to use in the navigate and auto functions. The program is freeware and may be distributed freely. No user license is required. Support is limited, but if you have any comments, remarks or suggestions for improvement or new functionality please let us know. WaypointsCreator can be downloaded from our download page. IPaNema reads any NMEA data from one of the serial ports (Com1-15) and delivers the NMEA data to any user selectable port and IP address using the UDP protocol acting as UDP server. It can also act as an UDP client, receiving NMEA sentences wrapped in UDP packets and outputs these to a serial communications port (Com1-15). All NMEA sentences received can be monitored while they pass along. IPaNema can be used to make received NMEA data (like GPS streams) available to any or all clients on an IP network, either wired or wireless using 802.11. Because it can be used both as server or client it gives the user much flexibility in situations were NMEA data must be transmitted over IP networks. Even more flexibility can be obtained when our NMEA simulator NemaStudio is used as UDP server, acting as NMEA talker over an IP network! Note also that several UDP clients can receive the NMEA data simultaneously so that NMEA data can be distributed to several locations in the network. The program is freeware and may be distributed freely. No user license is required. If you have any comments, remarks or suggestions for improvement or new functionality please let us know. IpaNema can be downloaded from our download page. 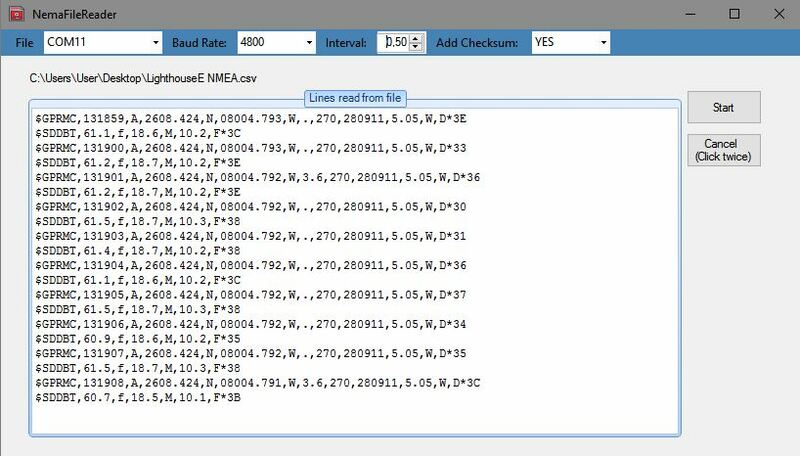 NemaFileReader reads any NMEA 0183 text file and outputs the file line by line to a user selectable serial port. File, baud rate, time interval and port number are user selectable, as adding an optional checksum. All NMEA sentences are shown in a window while they pass along. NemaFileReader is vary helpful when you want to re-play a logged NMEA file, also because the logged NMEA sentences can be send with a higher time interval between the sentences as originally recorded. Similar but of course more comprehensive and extensive functionality is embedded in NemaStudio. NemaFileReader can be downloaded from our download page.